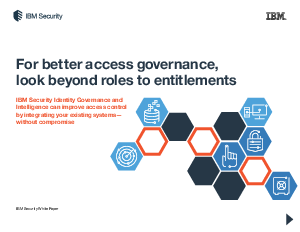 IBM Security Identity Governance and Intelligence sets the stage for business improvement by enabling you to grant the right entitlements to the right people. Using its deep visibility into entitlements, you can better enforce segregation-of-duties policies to ensure that currently authorized users don’t have conflicting entitlements. The IBM approach enables you to govern using business activities—shining a light on complex roles to make management easier for auditors and to simplify governance tasks.